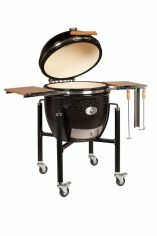 The focus of my smoked game recipes is to maintain the moisture in the meat as well as that all important smoky flavor. 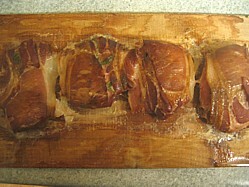 For example these pheasant breasts are wrapped in bacon (a technique also known as larding). I’m lucky in that I have friends and neighbours who are really into shooting so when the hunting season starts there’s game in abundance that’s ready for the smoker. Surviving in the wild means that these animals have to have their wits about them, hunt for food and avoid being hunted. For this reason wild animals get a lot more exercise than those reared for food therefore the muscular tissues are a lot more lean. It's this lack of fat that makes game need special attention to keep it moist during the cooking. If you’ve never tried game then you’re in for a treat don’t believe anyone who tells you it’s tough – work through my grilled and smoked game recipes, prepare with either a brine or a marinade and you’ll produce succulent flavorful meat every time. Smoked Duck Breast - marinated in an apple juice brine and lightly smoked. Smoked Canada Goose Breast - Marinated overnight in soy sauce, brown sugar and molasses and then lightly smoked for a deliciously succulent result. Smoked Pheasant Breast - Wrapped in bacon with a little fresh basil tucked in, when sliced it creates the best finger food this fall. Homemade Venison Sausage - I've two recipes for you here. The first is a cured recipes that is ideal for smoking and the second uses rusk and fresh herbs making it the prefect recipe for the grill. Note: Where I come from barbecue has been seen as a Summertime activity but more and more people are cooking outdoors all year round. Certainly ceramic grills have helped in our cold damp climate but if you’ve never barbecued into the Autumn / Fall then it’s time to get your patio lighting sorted out. These game recipes are for the grill and yes I know that rabbit is not really game but I really couldn't think of a better place to put it so here it is. Grilled Rabbit - Rubbed with crushed Juniper berries and brown sugar. Spit Roasted Venison - Rolled with sage and wrapped in crispy pancetta. Grilled Venison Burgers - packed with redcurrant jelly for a delicious fruity twist. 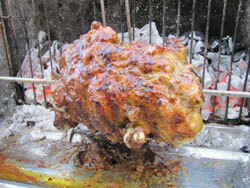 Rotiserie Grilled Venison Recipe - spit roasted steaks inter layered with bacon and herbs.